Qmotion battery powered blinds offer a simple and affordable way to add beautiful automated window treatments to any room of your home or office. No wires, no switches, Qmotion blinds are as easy to install as any standard roller blind and do not require mains power for operation. Power for the blind is provided by standard alkaline D cell batteries. Due to the special counter balancing springs installed within the roller tube itself the batteries provide up to 5 years usage based on an average 4 daily fully raise/fully lower movement changes. 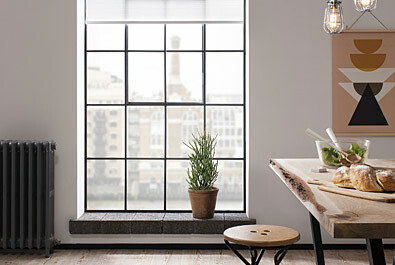 Up until now, the installation of traditional motorised blinds would have required a great deal of upheavel and the involvement of professional trades. Thanks to the innovative battery operated technology found in Qmotion blinds this is now a thing of the past. Blinds can now be fitted quickly and easily without causing damage to interior walls. The simple installation process also makes it possible to install blinds in locations that may not have previously been possible. Got a smart phone or tablet? Add a Qsync and download the app for iPhone or Android. Qmotion blinds also integrate with leading control systems such as Vantage, Control4 and Savant. With over 500 fabrics to choose from there is a Qmotion blind for every interior design scheme. And best of all, should you change your design scheme in the future, it is quick, simple and affordable to change your blind fabric to match your new interior. Fabrics can also be easily removed for cleaning and maintenance. *5 year battery life is based on four operations per day for an average size blind. By simply tugging the bottom bar you can lower or send the blind back up to either its last pre-set position or to a fully raised position, bringing a new level of convenience to blind control. Integrating Control4 with Qmotion has never been simpler. The new ZigBee battery operated blinds can be added to any project with ease. Control options include a timer remote that allows for up to six events per day that move the blinds automatically for sunset and sunrise in addition to four chronological settings. The multi-function remote control allows you to control one or multiple blinds at once. To find out more about Qmotion blinds, request a demonstration at our Surrey show house or to receive a complementary quotation, please call us on 01732 807 579.